After Food Delivery, Ola Is Getting In Online Groceries Business! Aah.. After Food Delivery, Ola Is Getting In Online Groceries Business! Ola is everywhere… Literally. Just a few days back they announced launch Ola Café, an online food delivery business along with their core business of car aggregation and rental. Now, it seems they are also entering into a vertical in which more companies have entered the space in last 3 months than previous 10 years – The Online Grocery business. While there is no confirmation from the company about this, a job ad posted on Babajobs clearly hints that Ola is getting into online grocery business. Have a look at this advertisement. 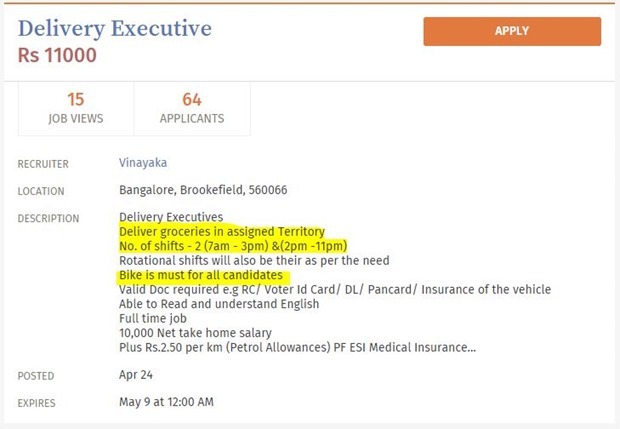 While the description does not mention anything, the specific profiles for jobs clearly states that they are looking at delivery executives to deliver groceries in Bangalore. See the highlighted portion. The Delivery executives are expected to work in 2 shifts and should be able to read and understand English. The ad also hints that Ola plans to start the grocery business in Bangalore first in certain areas as the job listing is put for 4 different locations in Bangalore namely, Marattahalli, Koramangala, Channasandra, and Brookefield. Description of profile for all the jobs is same. I don’t think there has been a vertical that has seen such a surge in players in such a short time. Just in last couple of weeks, players like Flipkart, Amazon and even Tata have thrown the hat in the ring. Since the start of this year atleast 5 startups in online grocery business have got funded. With Ola getting into Online grocery business, this space has already got very crowded in a very short time.